Blue-greens and green-blues are not my favourite colour (which I make no secret of) but I have been acquiring more of them recently. It's difficult to pick whether this is a blue that leans green or a green that leans blue; it's somewhat neutrally in between. It is a darker ink but it still has some shading which is surprising. This ink has no performance issues to speak of. It's decently wet, well lubricated and has not feathering or bleeding. It doesn't perform the best on cheap copy paper or a composition book nor Leuchtturm paper and loses a lot of its darkness (but I blame the paper, not the ink). Dry times are pretty moderate on Rhodia with it dry at 30 seconds. On Tomoe River it was still rather wet at 45 seconds so on Tomoe River it's a very slow drying ink. 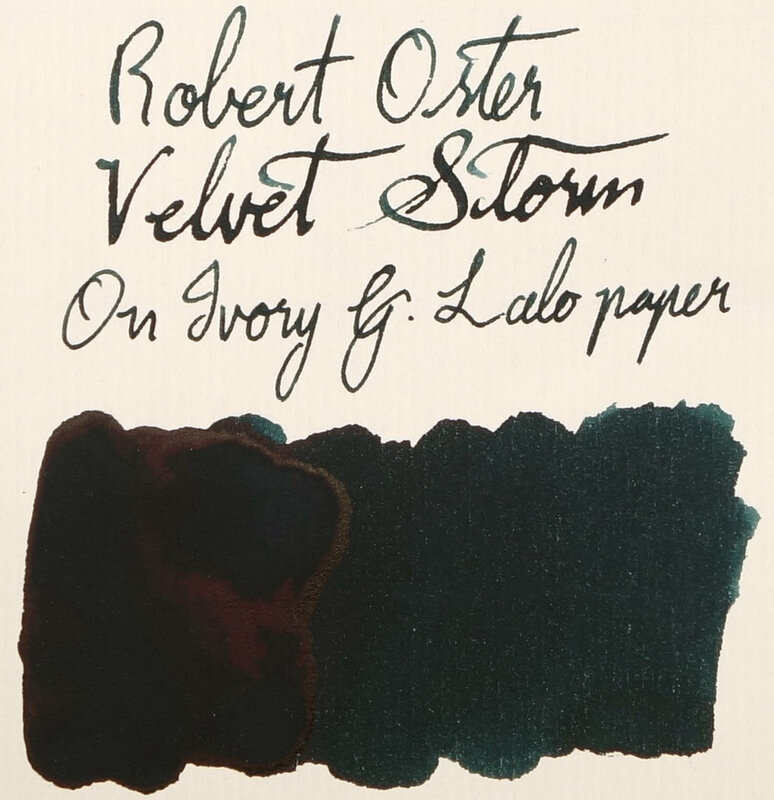 The Chromotography of this ink is fairly similar to many Robert Oster inks! 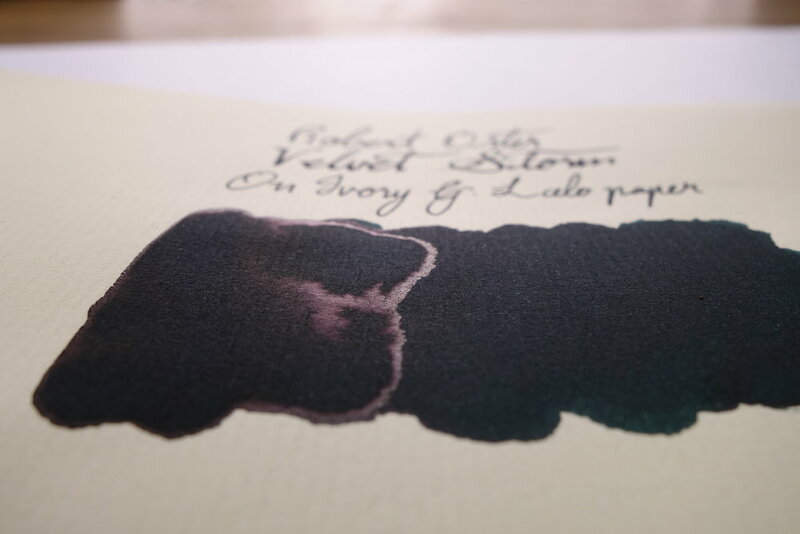 Graphite and River of Fire both to have a large portion of ink that isn't otherwise that visible in the ink on the paper and River of Fire's chromatography in general looks fairly comparable the Velvet Storm. Pink leading to green leading to a turquoise. This ink has little-to-no water resistance. 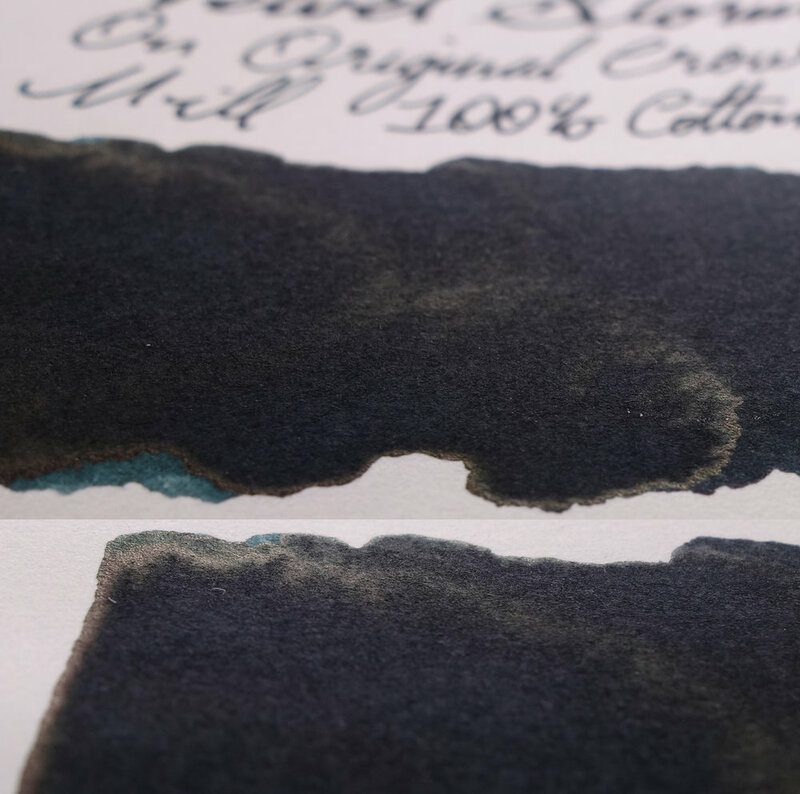 On the review pages I have included the following inks that compare well (top to bottom): Robert Oster Green at Night, Robert Oster River of Fire, Lamy Petrol, Noodler's Dromgoole's USS Texas, Noodler's Air Corps Blue-Black, Noodler's 54th Massachusetts. My first thought when I saw this ink was "Lamy Petrol" and I think Lamy Petrol is a very good comparable ink to this. On Rhodia it's a little darker but the colour is very similar and in fact I think the closest. 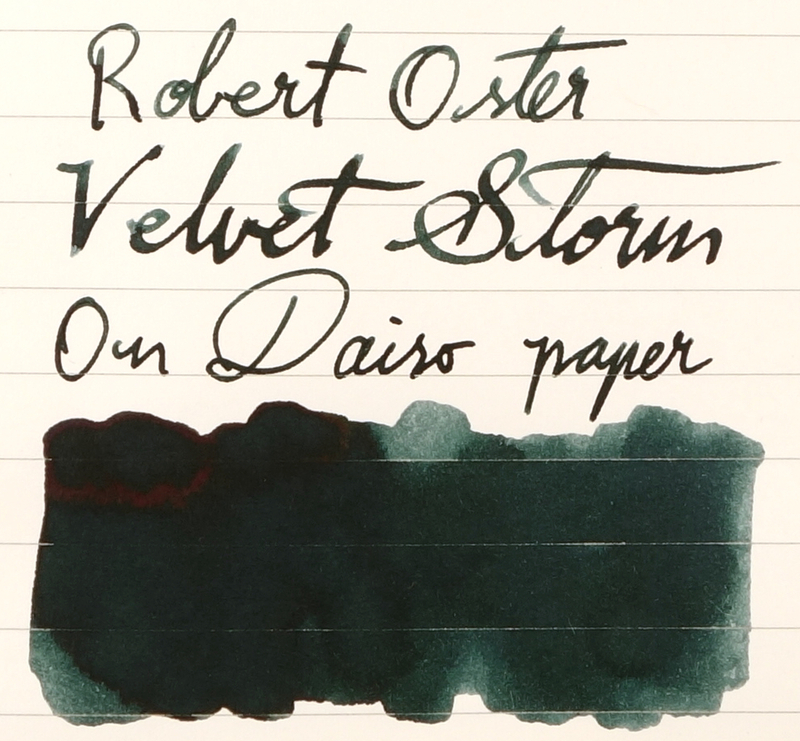 As often with Robert Oster inks, many of the comparable inks are his own (especially in the blue and green families!). 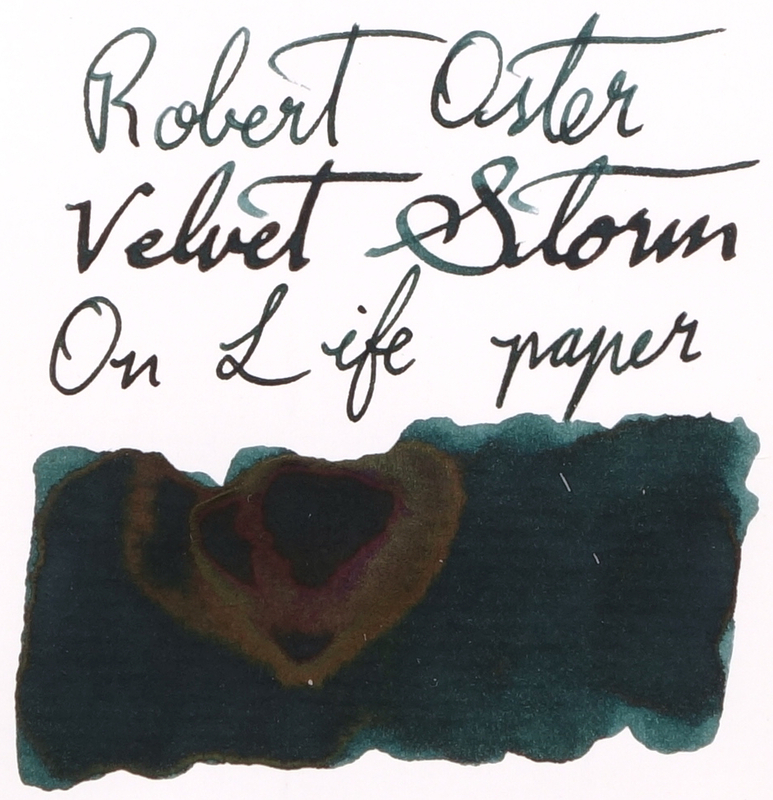 Robert Oster Green at Night is a similar darkness but lacks a lot of Velvet Storm's blue. 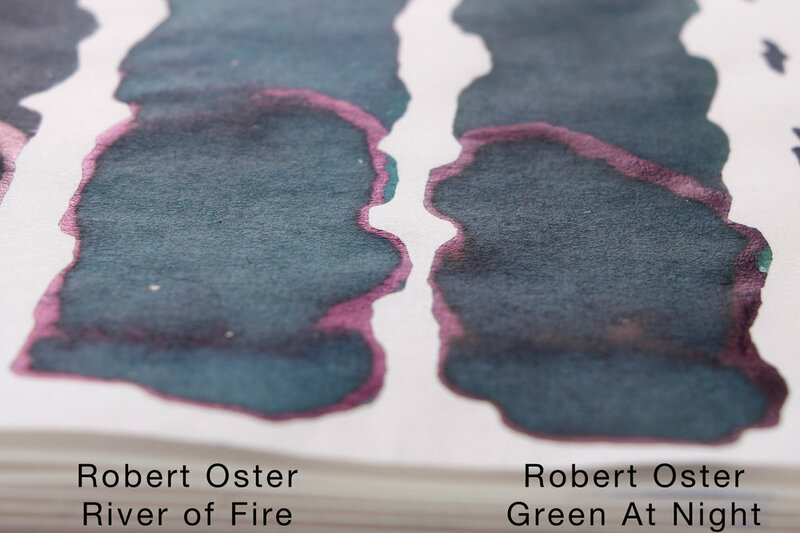 Robert Oster River of Fire is too light and also not blue enough. 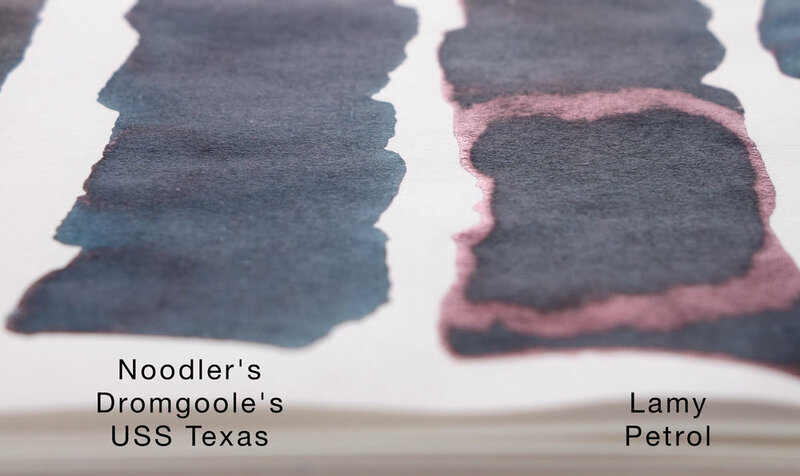 Finishing off with three Noodler's inks Noodler's Dromgoole's USS Texas is another very similar hue to Velvet Storm but is missing the shading, contrast, and just looks a lot flatter. 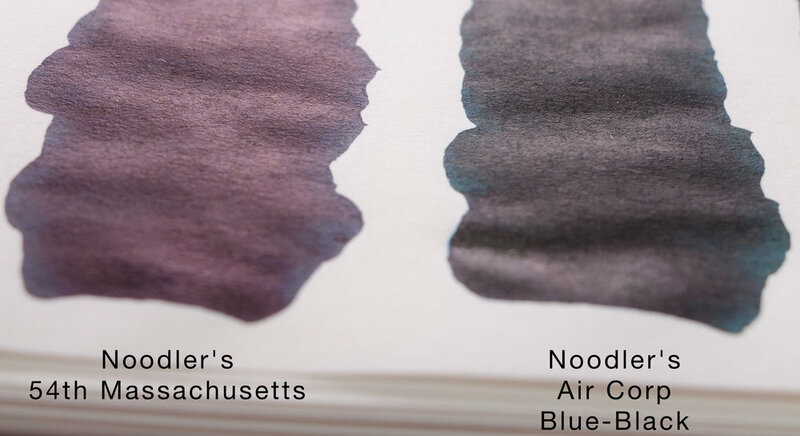 Noodler's Air Corps Blue-Black also compares very well but is more vibrant. Noodler's 54th Massachusetts is much too dull overall. 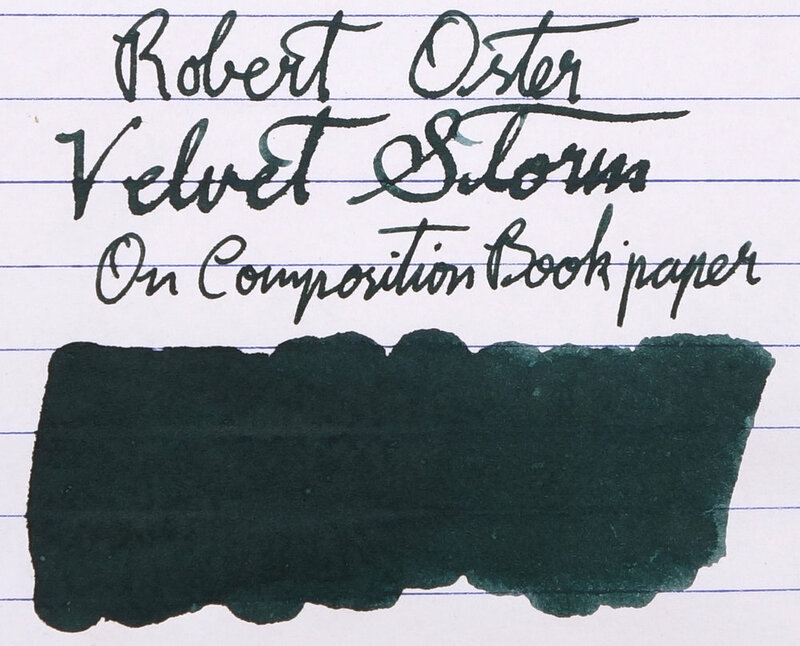 Top to bottom: Robert Oster Green at Night, Robert Oster River of Fire, Lamy Petrol, Noodler's Dromgoole's USS Texas, Noodler's Air Corps Blue-Black, Noodler's 54th Massachusetts. 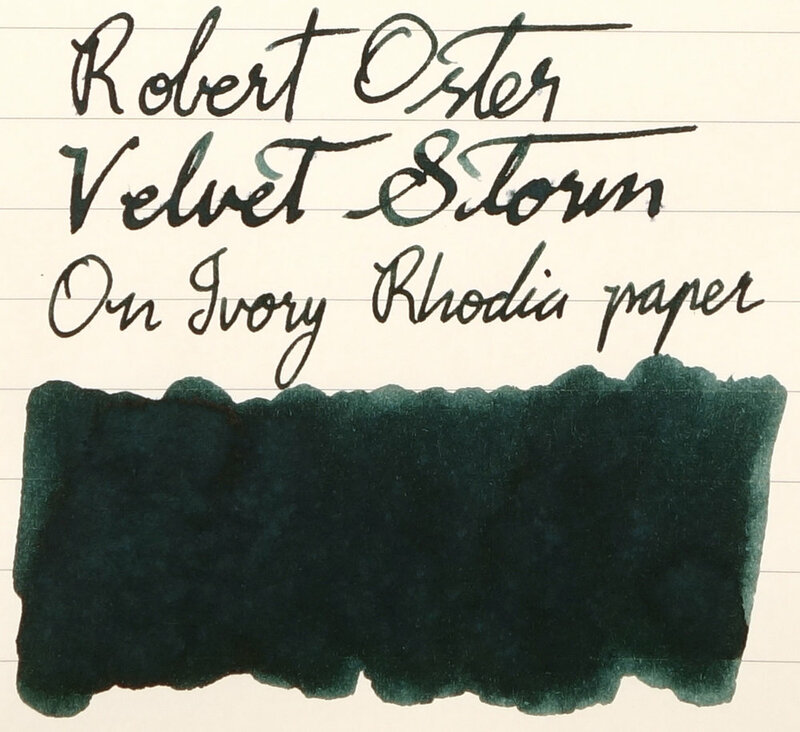 On Tomoe River Velvet Storm picks up some vibrancy in the written words but the heavy swatch somehow loses some (Tomoe River can be strange like that). Some of the comparison swatches react similarly losing how vibrant and saturated they are. Green at Night and River of Fire, like on Rhodia, are still too green and River of Fire too light but the vibrancy is much lower. Lamy Petrol is a little greener here but the colour is still a good comparison. USS Texas is gained some life here and is less flat; on Tomoe River I think this is the closest ink. Air Corps Blue-Black hasn't changed but as the swatch of Velvet Storm is less vibrant and saturated by comparison Air Corps is even more so. 54th Massachusetts has also become more vibrant and isn't a bad comparison any more but is definitely darker. 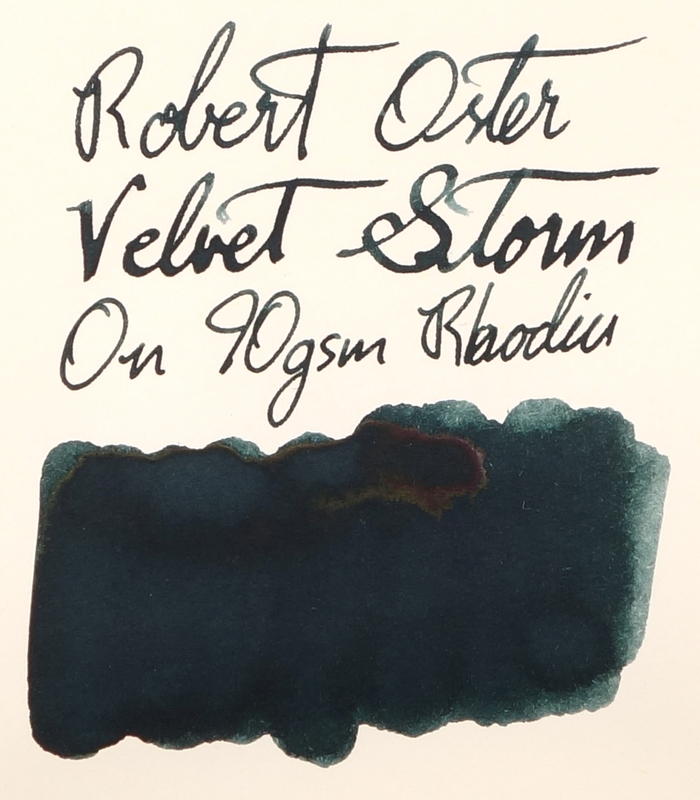 The three Noodler's inks to offer a bit of sheen but it's a matte sheen that covers the whole swatch as with Air Corp and 54th, or negligible as with USS Texas. 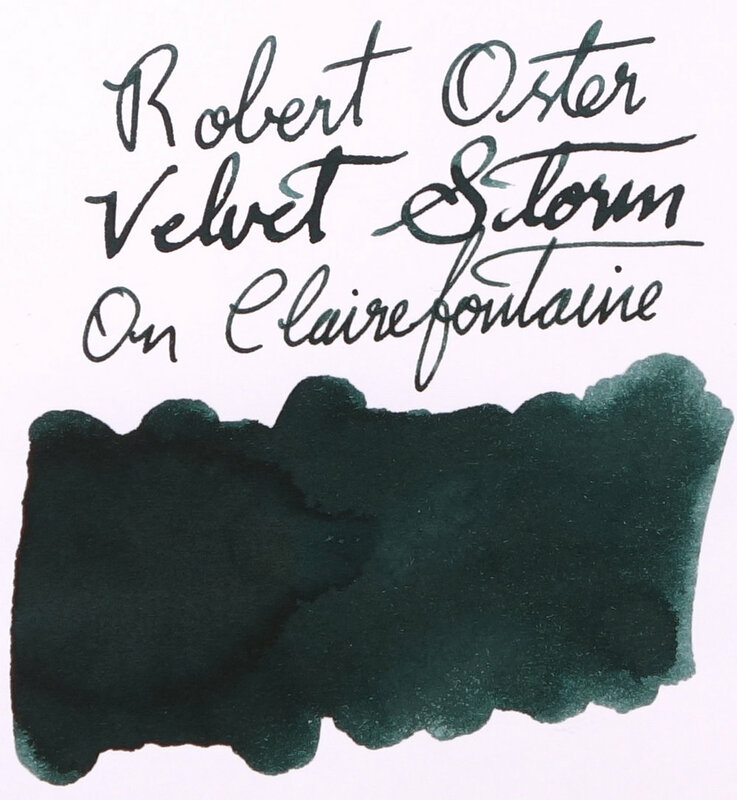 The sheen from the two other Robert Oster inks and Lamy Petrol is very similar. 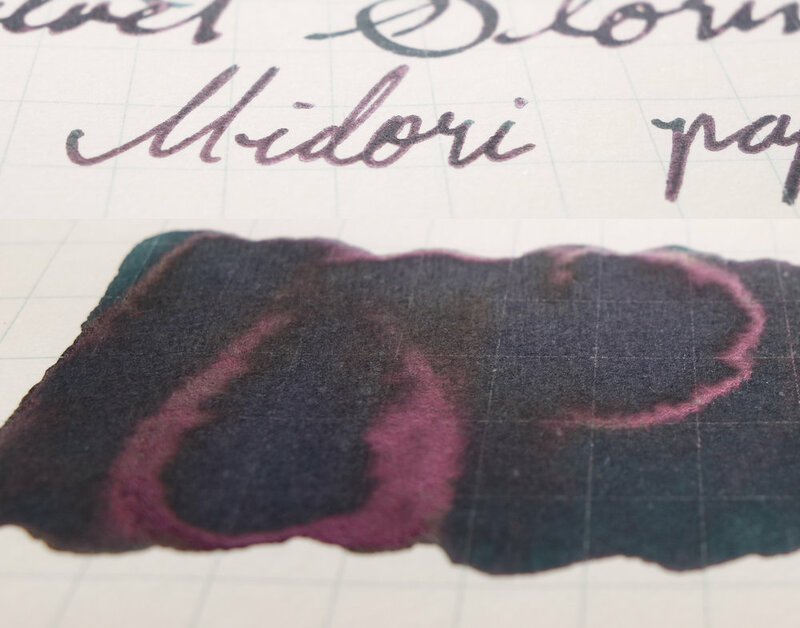 Only on the edges where the inks pool and also a duller sheen (compared to the vibrant bright sheen of, for example, Organics Studio Twilight Blue). 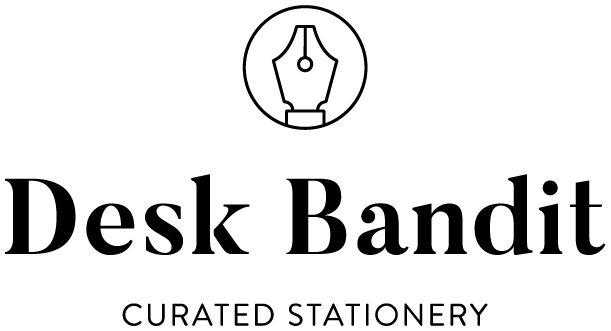 If you use this ink, with wet pens, on different papers you are going to get a very unique sheen experience with this ink. It's a subtle ink that is business appropriate, I believe. The sheen isn't an eye catching sheen and is a subtle sheen. It performs well and you still get some character building sheen out of a relatively wet ink which is great. 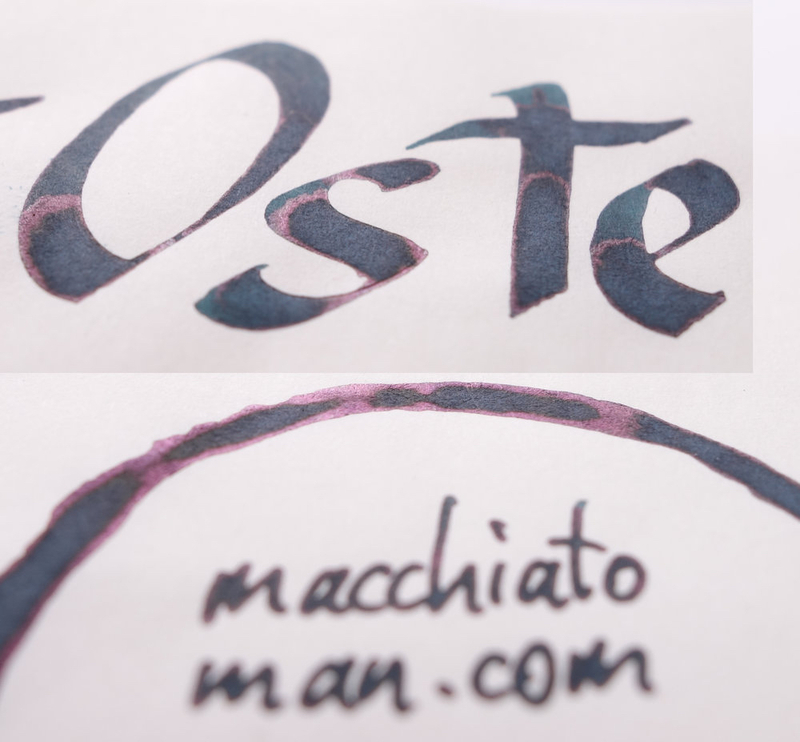 Even with my Visconti Homo Sapiens 1.3m stub (the definition of a gusher) and on Tomoe River (which is my experience slightly decreases shading) you can get some shading out of this (though not much). 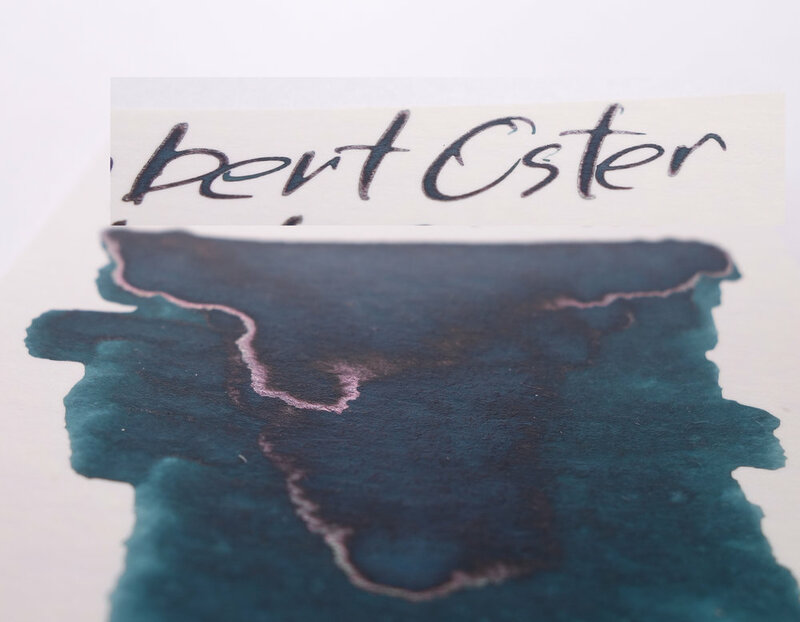 It's a subtle ink with character and will be a great alternative to Lamy Petrol when that Limited Edition runs out! 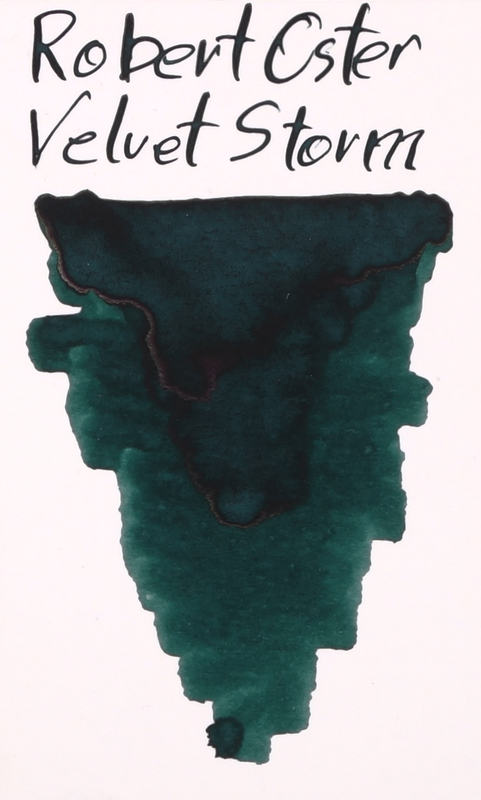 Thanks again to Pen Chalet for sending this ink over to review!